I love the creativity that goes into making a costume! And the satisfaction of saving money when doing so! 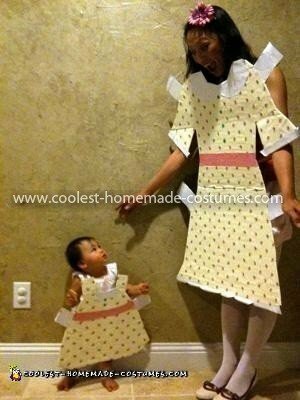 The paper doll costumes I made for my baby girl and I cost a total of THREE dollars!!! I was inspired by a large cardboard box in our garage that was about to go into the recycling. 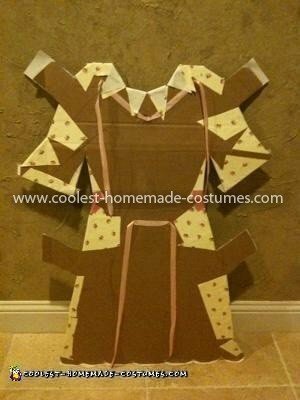 I had my husband trace my outline on the cardboard and then I cut it into that shape of a dress (with tabs). I found wallpaper leftover by the previous owners of our house and used that to cover the dress cutout. I used construction paper for the accents, and ribbon in the back to help attach the paper dress to myself. I tied the ribbon around my neck and around waist. I wore my “undies” behind the dress. My “undies” were a tank top and a pair of pajama shorts I bought at a thrift store for $3! I altered the shorts a bit to make them look more like bloomers with bows and all! You could also wear a slip, or anything that gives the idea of “undies”. 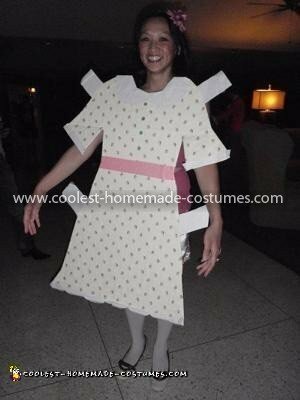 The Paper Doll Costume was a hit at the party we went to and we won for MOST ORIGINAL!